Anon. sale, Sotheby's Amsterdam, 14 November 1988, lot 39 (to Butôt). F.C. Butôt, Sotheby', Amsterdam, 16 November 1993, lot 97. G.L. Gordon, Supplement to the Catalogue of the Netherlandish Paintings and Drawings from the Collection of F.C. Butôt, London, 1989, no. 120. No certain drawings by Mancadan are known. 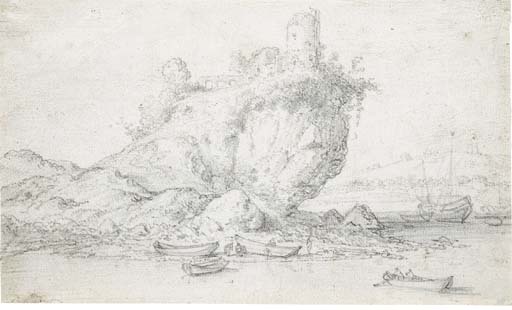 The present attribution is based on a comparison with the artist's paintings, particularly noticeable in the depiction of sparse and rocky terrain, The motif of an overhanging outcrop with rowing boats is found in a painting in the Russell Collection, Amsterdam, Zee en Riviergezichten, exhib. cat., Dordrecht, 1964, no. 52, fig. 58. Drawings by the same hand were sold at Christie's Amsterdam, 18 November 1985, lots 30-33.